It's no secret I love this race, and this year was one of the best ever. I've enjoyed being an ambassador for this event for the past two years and I've met so many wonderful new friends thanks to that opportunity. 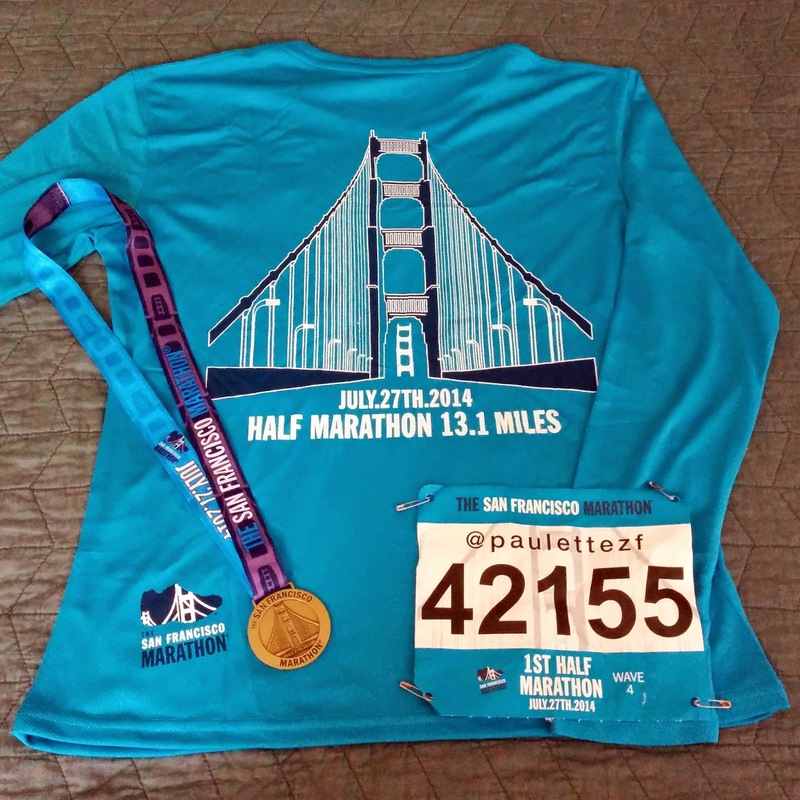 A big thank you to the SF Marathon organizers for letting me be a part of everything! Also, this post is really long and full of photos; if you want only the race logistics, jump to the bottom. Here we go! 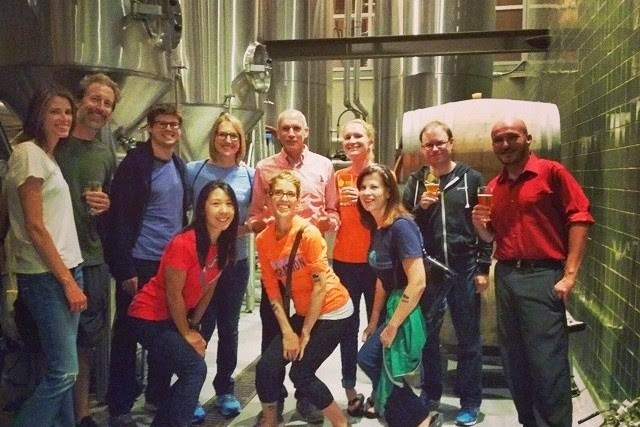 The weekend festivities started on Friday with an unofficial Ambassador dinner and brewery tour at Thirsty Bear Brewing. Many of us love beer, and Wes planned the event and invited everyone to come hang out. I hadn't planned to go up after work on Friday, but at the last minute I Pricelined a hotel and headed up to the city; I'm so glad I didn't miss the dinner! It was really the only time I got to talk to everyone in a more relaxed environment, plus Bart Yasso joined us which was amazing. Touring the brewery and learning about beer. The next morning Kevin and I joined many Ambassadors and tons of other runners for the Bart Yasso shakeout run. I loved how big the turnout was for the run, and I ran and chatted with quite a few new people. The expo was at the new location by Fort Mason this year, which means the shakeout run was along the gorgeous waterfront in the Marina - one of my favorite places to run. I highly recommend going to the shakeout run if they have it again next year. Kevin and I with Bart at the shakeout. After the shakeout run, Kevin and I picked up our race goodies and wandered around the expo for a while. I hung out at the info booth with other Ambassadors (some officially working, others of us being around and answering a few questions when it got busy.) We had an Ambassador lunch at 11:30 and then I went to start working my shift around 12:15. I sent Kevin to the hotel because he was running the marathon and did NOT need to be on his feet anymore that day. I worked the 2015 registration booth with Meg and Bonnie, which was fun. I loved getting the chance to catch up with Meg and to meet Bonnie; the people are always a highlight of SFM weekend. The expo ended at 5 pm, and after a bit of clean up I headed outside to see the other Oiselle team ladies who would be running the race. They were heading to dinner, but I was very tired and sweaty so I opted to go back to the hotel to shower and have a low key dinner with Kevin. My tiredness was not helped by the 3+ mile walk back to the hotel thanks to incredibly long lines to get on transit, but I managed. 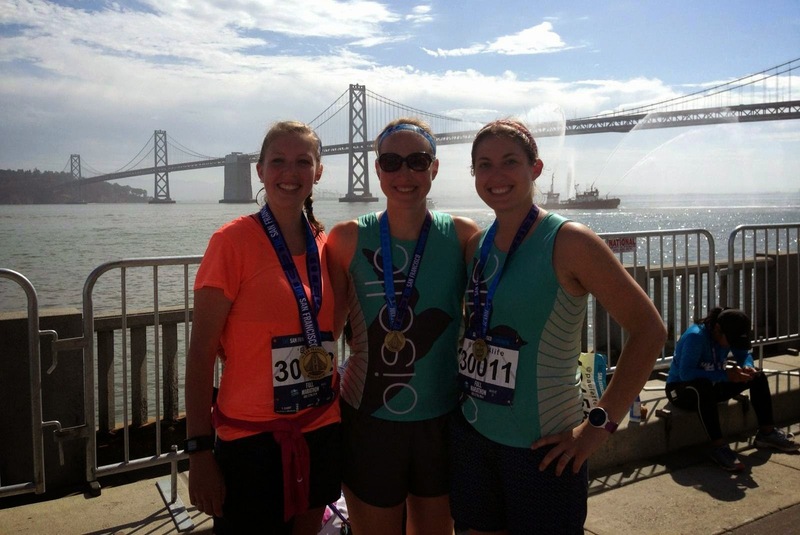 Oiselle team ladies with Alcatraz! Bret, Michelle, Emily, Jen, Robin, and me. I slept well, which is strange for me the night before a race, and woke up around 4:30 am to get ready. Kevin was running the marathon and starting in wave 2 at 5:32 am, and I was starting the 1st half marathon from wave 3 at 5:42 am. As soon as I stood up, I knew my legs were shot for running 13 miles that day. By no fault other than my own, I way overdid it on Saturday. Lesson learned. Our hotel was literally right at the start area, so we walked out the door and there was everything. It was freaking fantastic. We were immediately stopped by a photographer, who I happily posed for because photos are free. Yes you read that right, free. We headed to the Ambassador and Pacer tent to say hello to everyone and to drop our gear bags off. Kevin almost immediately went to the start corral to stretch and get in place, and I chatted with friends. Soon it was time to get in the corral and I waited for the start with Wes, Alisyn, Miriam, and Corinne. 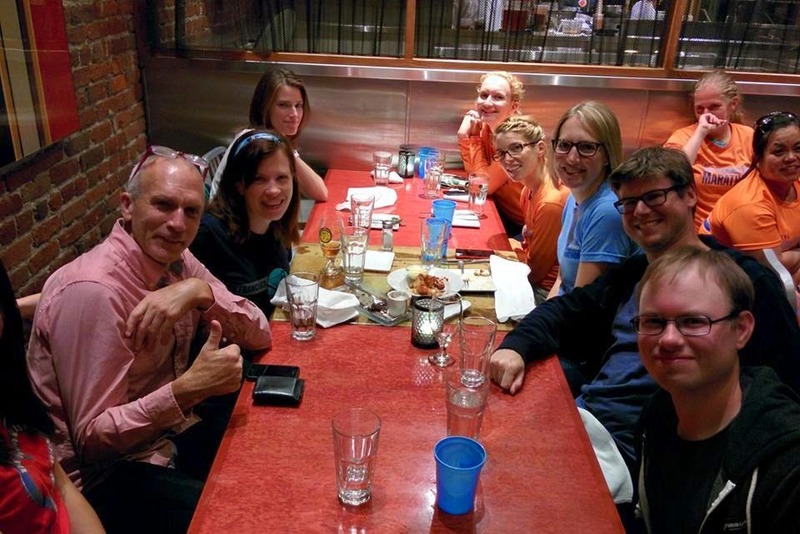 I wasn't sure if I'd run with anyone, but I ended up being with Alisyn, Wes, and Miriam for quite some time. 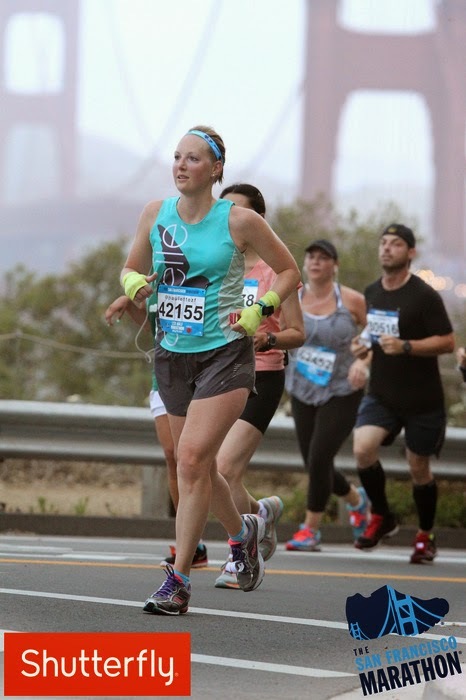 I'm so glad I was, because my legs were already unhappy by mile 1 and I needed the help to keep going. The race starts flat along the Embarcadero, and the first hill is over Fort Mason. I enjoyed Alisyn starting the hill count with 'One hill - ah ah ah' and did my best to keep up with the group. 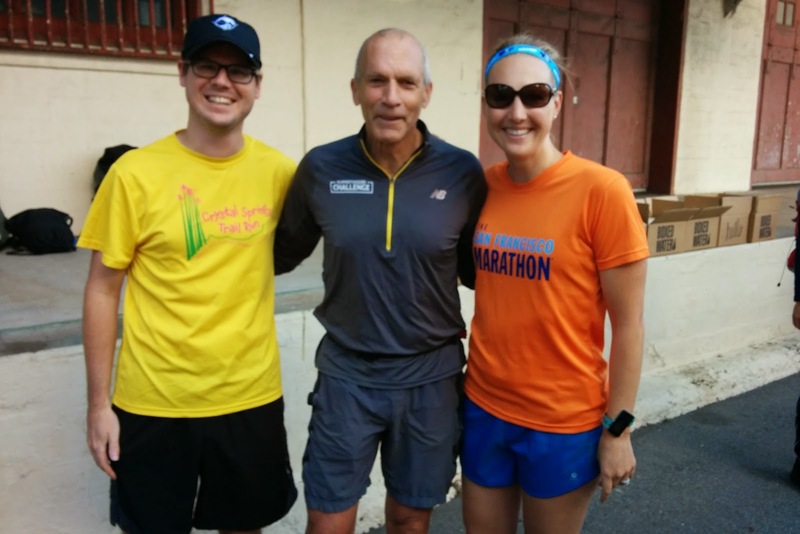 Even though my brain kept wanting to give up on running, being with friends kept me going. When we hit the hill up to the bridge ('Two hills - ah ah ah') I lost everyone for a bit when I slowed to eat but caught back up to Alisyn and Wes on the bridge. I love running the bridge and got a little pep back in the legs for that portion. Even better, I saw so many friends during the out and back portion of the bridge. It's so much fun to hear your name and to cheer for others during the race. The hill after the bridge felt incredibly tough as it always does; it has long been my nemesis. Someday I need to go run hill repeats on it. I did a bit of walk/run on the steeper stuff even though I'd hoped not to. 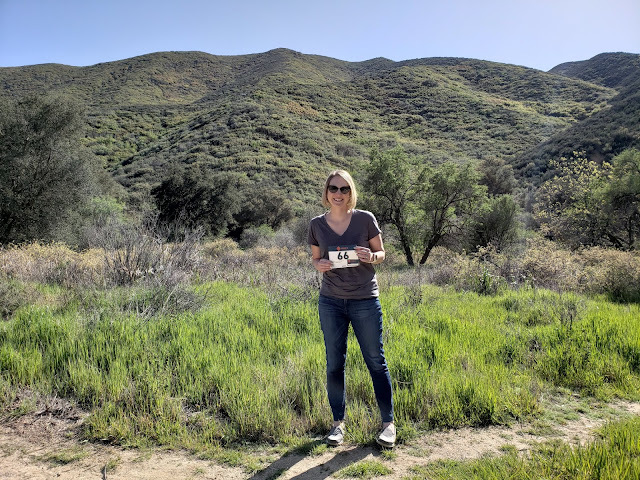 I knew my hill training had been better than usual, but my body also felt really, really tired that day. Topping off that nemesis hill. The downhill portion of Lincoln Boulevard was fun, and the hills of the Presidio made the last two miles hard. We climbed the last bit in Golden Gate Park and finally, there was the finish line. My time was 2:12:32 for a course PR but I wasn't really happy with this compared to my goals. It's never fun to feel sluggish and tired during a race. 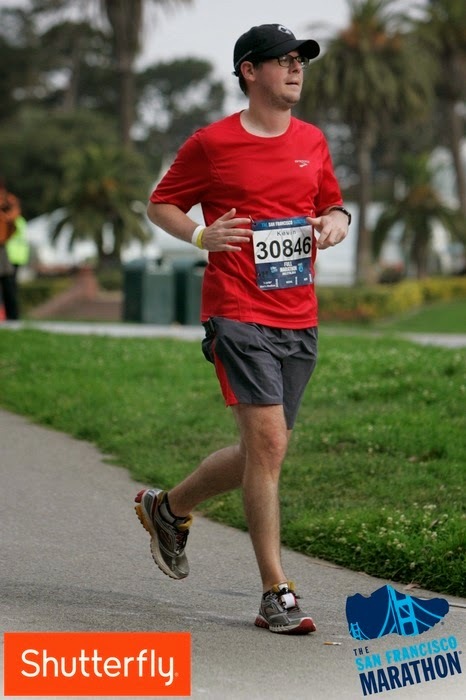 That said, I ran 2:13:36 in 2012 when I felt awesome and this year I ran one minute faster when I felt terrible. I guess I can still call this an improvement. 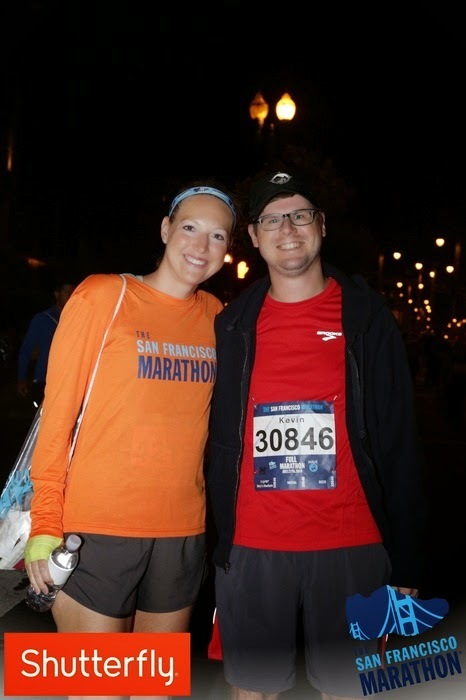 Moving on to happier race results, many of my friends accomplished marathon goals at SFM and I'm so proud of them! Kevin ran 3:49, about 10 minutes slower than his PR but this is a much harder course. 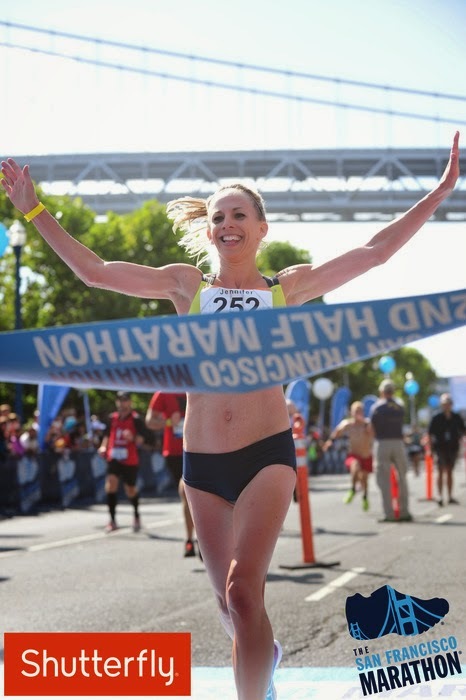 Jen, one of the Oiselle elites, won the 2nd half marathon and looked fantastic doing it. Kevin finishing my nemesis hill. Kevin running in Golden Gate Park. Jen breaking through the tape! After the race, I stayed around the Ambassador tent and enjoyed talking to friends. We hit the free beer tent to enjoy a post-race brew, where we also found Jen and her husband Jeff. I've already said this, but knowing so many people at the race is one of the best parts. It feels like a big party with friends. Heather, Sophia, and I with the Bay Bridge. Sophia, me, and Jen at the beer tent in the new singlets. Everyone at the beer tent! The Expo. This year the expo was at Fort Mason, a change from where it has been held in the past. We arrived early for the run and had no trouble parking, and I loved the new location. The set up was lovely, it was scenic, and it was a large venue. The location also made for a very nice shakeout run route. However, I did hear that some people had a very hard time with parking near Fort Mason and others who took the shuttle from Sports Basement said the lines were long. Something to be aware of if the location stays at Fort Mason next year. There were tons of vendors, lots of free snacks to try, and the merchandise was really pretty. Overall I found the expo to be a step above past years with regards to organization, ease of packet pick-up, and vendors. The Course. I love running in SF, although it's important to note that the 1st Half Marathon course (and therefore the first half of the Marathon course) has some climbing. The second half of the marathon is gentler but still involves some gradual uphill through Golden Gate Park and a couple of steeper hills later. I like this challenge and the views that come with it - not to mention running the Golden Gate Bridge - make it even more worthwhile. This is one of the few races that lets half marathoners choose which half to run, and that's a fun thing too. If you run both in consecutive years, you get the 'Half It All' challenge medal. I highly recommend this course and don't let the hills deter you; this was my first half marathon ever back in 2009 and it was great even as a beginner! The Support. Volunteer support was sufficient and good. Aid stations were generally fast and had cups ready for runners who wanted to pass quickly. They offered gels around mile 7.5 and there were plenty of porta potties along the way (plus real park restrooms a couple of times too.) There is a group of motorcycle guys who always volunteer and they are awesome. I didn't use the bag check because I had the Ambassador tent bag check, so I can't comment on how it was this year. The Finish Line. The 1st Half finish was pretty deserted when I got there even at my 2:12 finish time, so there were no lines yet. I didn't go through the food area and instead headed straight to the bus back to the start area with Wes. There wasn't really a bus line either, big win. The main finish line, which I consider a big perk of running the 2nd Half or the marathon, has many more people cheering and better food. Oh, and it has the beer tent. They offer Irish Coffee at the 1st Half finish as the drink, but many of us saved our drink tickets to have beer at the main finish line later on. Again, I can't comment on the finish line food much because I was partaking of the Ambassador tent goodies instead. The Swag. Last year the shirts didn't turn out great and they had many complaints, but this year the official race shirts are really nice. They are soft tech shirts with long sleeves and nice designs. The medals were nicer this year too; I love when the ribbons go through the medal itself. Half Marathon shirt design, from the back. In closing, SFM was a wonderful weekend once again. 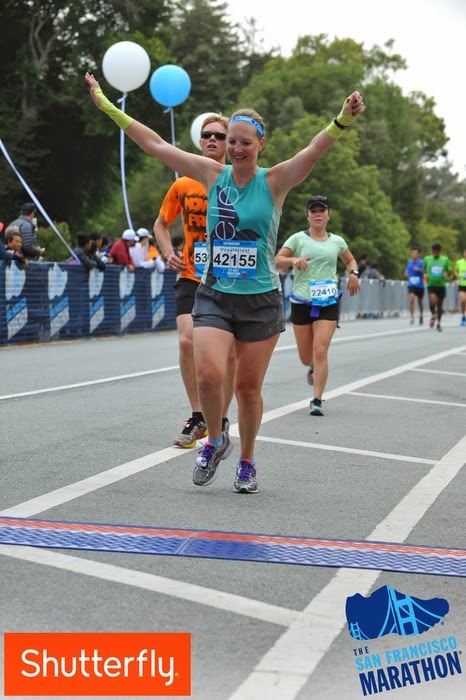 I'm still pretty bummed that I had to drop from the full marathon due to the injury earlier this year, but I haven't given up. I'm already signed up for the marathon next year. If only I didn't have to wait a whole year for this race to come up again! Fort Mason for the Expo sounds way more interesting to me. Anway, I skipped it this year, perhaps next year. So I'm realizing that somehow your blog got lost in my transition to a new reader.....Glad I caught this recap so I can add you back in!! 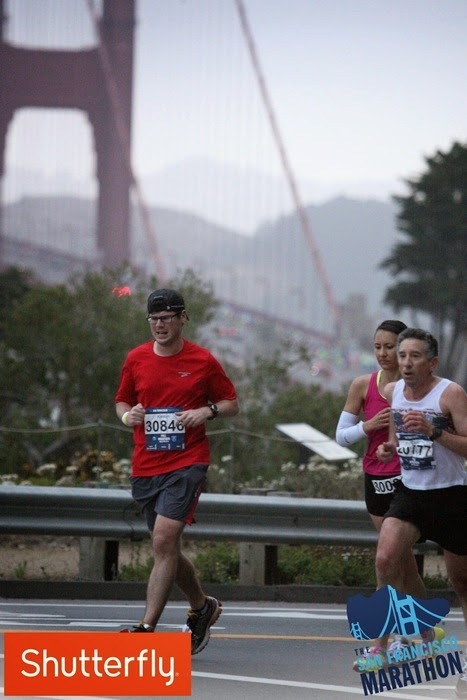 Ah, the first half really does make for some spectacular race photos. You're almost inspiring me to run it next year! I have to say I loved the beauty of the 2nd half marathon course, the free photos, and seeing you ladies! I'm so happy I'm here this summer so I could run it! Great job again to you and Kevin! You did great! And I loved your recap. Those free pictures are pretty sweet. I wish more races would do this! Congrats to you and your hubby!